It’s time to start counting down the days of 2012 and make false promises to ourselves about how awesome we’ll be *next* year. So, in the spirit of enormous laziness, I’m going to predict nothing, nada. 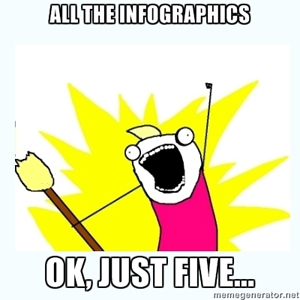 Sure, 2013 will be amazing – but it may also be the demise of the infographic (ok, I lied – that was a prediction). With that in mind, let’s take a moment to shed a tear and look back at 5 of the super-long, stat-filled, pixel-bloated, ego-driven works of art that made us all feel good as creative professionals. Also, they’re all about conversion, so if you see that orange button at the top-right of the page, click it! Consider it your present to us. BTW: If you don’t share this post you will get NO PRESENTS FOR CHRISTMAS! (or other celebratory occasions). This infographic outlines the path to conversion from first brand exposure to your post-conversion strategy. But don’t get distracted by that wicked witch of the west, just follow that yellow brick road and you’ll be on your way to Emerald City. Okay enough with the Wizard of Oz references. If you follow this path, you’ll be bettering your competitors when it comes to effective landing pages. Are you ready for a ton of scrolling? Brace yourself, this infographic is longer than the odds that Rick will beat me in a Twitter contest. Take a giant road trip through North America with us from Boston (HubSpot HQ) to Vancouver (the home of Unbounce and landing pages) and learn mile-by-mile, how to create a landing page that converts. Warning: Each stop has one of my weird and tenuous metaphors based on a famous landmark, designed to help you learn about the different elements in a great landing page. By the end of the trip you’ll be ready to build higher converting landing pages, and there’s no better place to do it than Unbounce. Sit back, buckle up & enjoy the ride… it’s long. One of the hardest things about conversion is getting up-to-date stats (many people want average conversion rates, but unless you get them for specific industry verticals, they are often just vanity metrics). The nice thing about this infographic is that it keeps it simple and only gives one example – for retail. The bad news is, that despite growth in the market, conversion rates are going down. Bad marketing? Improper use of testing methodologies? Lack of expertise? All of the above? The infographic suggests that the reason for the decrease in conversion is due to too much money being spent on acquiring visitors ($92), but virtually nothing ($1) is spent on converting them into customers. If you are in this boat, you should read about Conversion Economics, you’ll learn how much of your monthly budget you should be spending on optimization efforts, compared to driving traffic to your site. And if you want even more of a breakdown, read the Unbounce breakdown of the Conversion Optimization Report 2012. Psychology, when used properly, can increase your conversions by interacting with your customers in a more intelligent, and almost subliminal way. We featured this badass infographic recently on our blog and it is just too good to leave out. So here it is again. 10 techniques to teach you how to apply some science to your marketing. And if you want extra examples, check out the author’s Unbounce post that compliments the infographic. Click for the infographic source – which also has a 48-page PDF about the subject. Infographic #5 covers 4 essential parts of the process you need to master in order to build a landing page that converts: Design & Layout, Form Essentials, Providing Value, and Analyze & Revise. 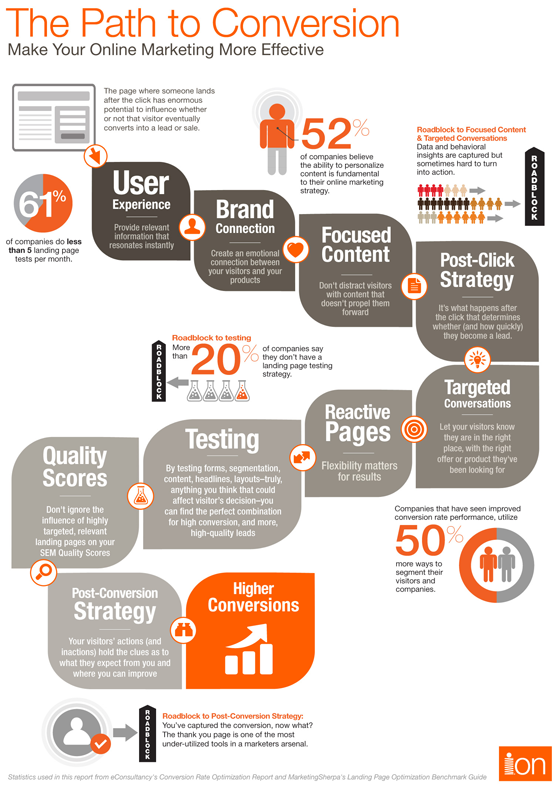 If you want more on this, take a look at the Unbounce dissection of this infographic. And you’ll get a bit more of my sometimes ridiculous – but always methodically crafted humor/wisdom. Any other great infographic on conversion we missed? Let us know in the comments!